These are the BEST Chocolate Chip Cookies! They are soft, chewy, and loaded with chocolate chips. 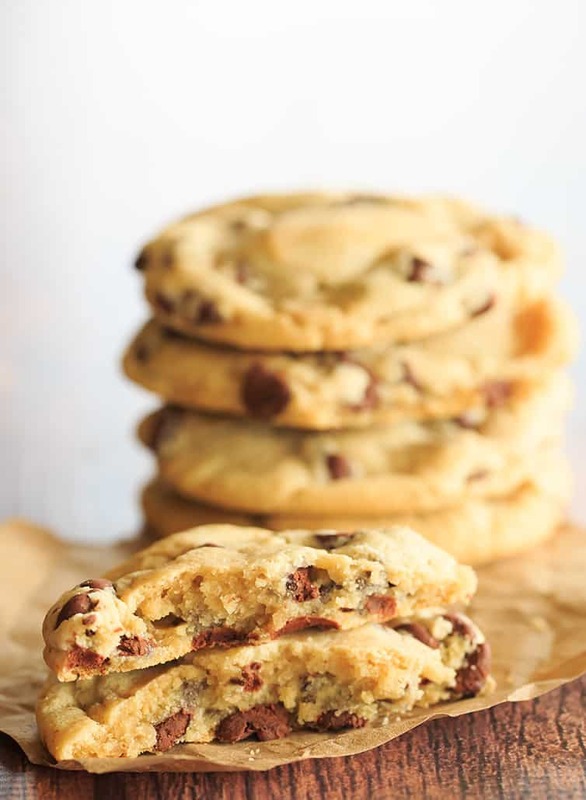 You will never need another chocolate chip cookie recipe! These cookies have been my absolute, hands-down favorite chocolate chip cookie for the last five years or so. If you’ve been following along for any length of time, you know that I lived and died by the thick and chewy chocolate chip cookies from Cook’s Illustrated for ages. They were, indeed, thick and chewy, which is my favorite type of cookie. Unless it’s a pizzelle or biscotti, I feel like crunchy cookies are a waste of perfectly good calories. I was riding the thick and chewy chocolate chip cookie train until I found the NY Times Chocolate Chip Cookies which are even thicker and chewier! Those are absolutely enormous cookies that are loaded with dark chocolate chunks and topped with flaked sea salt. To say they are good, or even great, is a massive understatement. However, they definitely fall into the “special occasion” category of cookie given their jumbo size and insane amount of chocolate. I took that recipe and threw in a few tweaks to make them more of an everyday chocolate chip cookie, and I’ve been using it exclusively ever since. How Do You Make Chewy Chocolate Chip Cookies? 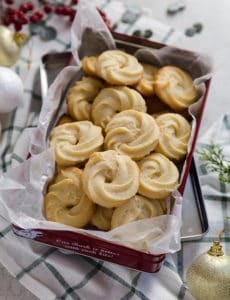 I kept with the unique combination of bread flour and cake flour for these cookies, which gives the cookies a sturdy, yet soft texture. (A quick note here – I realize not everyone keeps both bread and cake flour on hand, so if you need to substitute all-purpose flour, you can do so without totally compromising the texture of the cookies. Check the recipe notes for the amount.) To amp up the soft and chewy factor, instead of two whole eggs, I use one whole egg and one egg yolk. Then, instead of using over three cups(!!) of dark chocolate chunks, I scaled back to 2½ cups of regular semisweet chocolate chips. I think this is a perfect amount, but I will say that my husband falls into the “less is more” faction of chocolate chip cookie eaters and prefers more cookie, less chocolate chips (my brain just can’t compute that), and he thinks there are too many chocolate chips. If you are in his camp, then you may want to dial the chips back to two cups or a little less. Next, I omitted the sprinkle of sea salt entirely – it’s great paired with the dark chocolate, but I don’t find it necessary for an everyday chocolate chip cookie. I also cut the refrigeration time down from the recommended 72 hours to overnight, maximum. 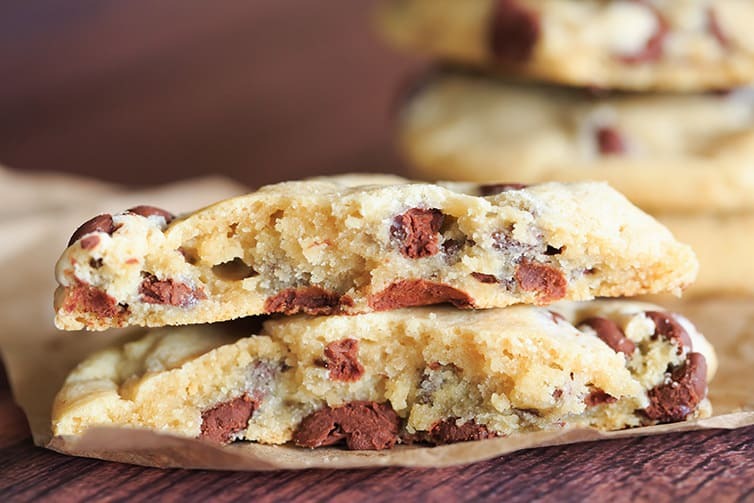 The long refrigeration really intensifies the flavors and creates almost a caramelized or browned butter taste, which, again, is great with dark chocolate and sea salt, but I really didn’t care for it in a plain chocolate chip cookie with semisweet chocolate chips. Finally, I decreased the size of the cookies from 3½ ounces of dough to 2 ounces (or about 2 tablespoons of dough). 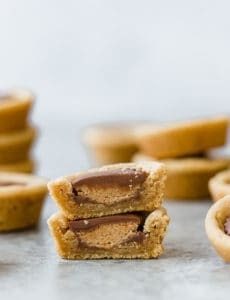 They’re still a significant cookie and not at all “bite size”, but definitely more manageable than the super sized original. 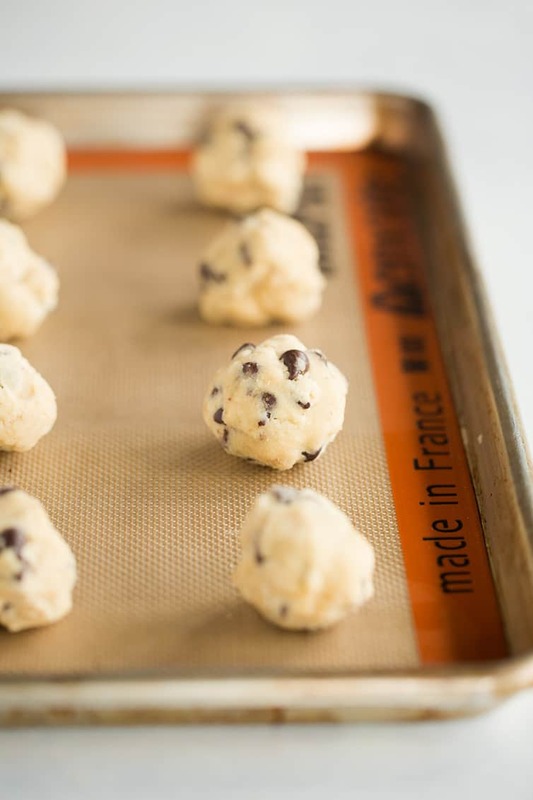 Freeze Before Baking – You can shape the dough into balls and place them on a baking sheet until they are frozen. Then store in a ziploc freezer bag for up to 4 months. Bake them from frozen, adding an additional couple of minutes to the bake time. Freeze After Baking – Once the cookies are baked and cooled, wrap them individually in plastic wrap, then place in a ziploc freezer bag for up to 3 months. I’ve done both, and they freeze remarkably well either way! 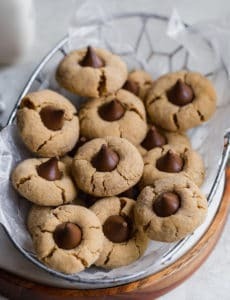 I really adore these cookies; I made batches of them a couple of weeks before Joseph, Dominic and Isabelle were born and stashed them in the freezer, then brought a handful to the hospital with me… best decision, ever. I’ve tried to keep some in the freezer ever since; they’re my favorite sweet treat at the end of the day and don’t take long at all to thaw. 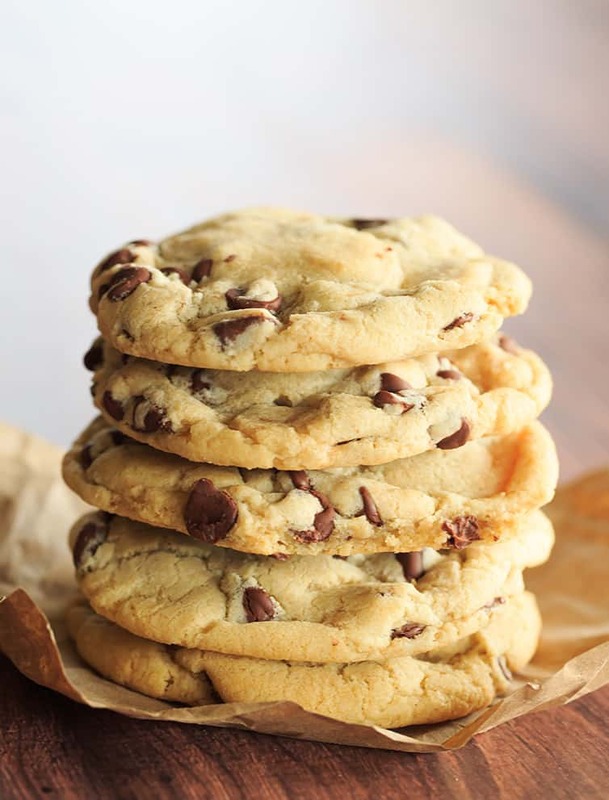 What are your favorite kind of chocolate chip cookies? Cream together the butter and sugars on medium speed until very light, about 5 minutes. Add the egg and the egg yolk one at a time, mixing well after each addition, then add the vanilla. Reduce the mixer speed to low, gradually add the dry ingredients and mix until just combined, 5 to 10 seconds. Using a rubber spatula, fold in the chocolate chips. Press plastic wrap against the dough and refrigerate for at least 2 hours, up to 24 hours. Scoop 2 ounces of dough, roll into a rough ball (it should be a little larger than a golf ball) and place on the baking sheet, leaving at least 2 inches of space between balls of dough. 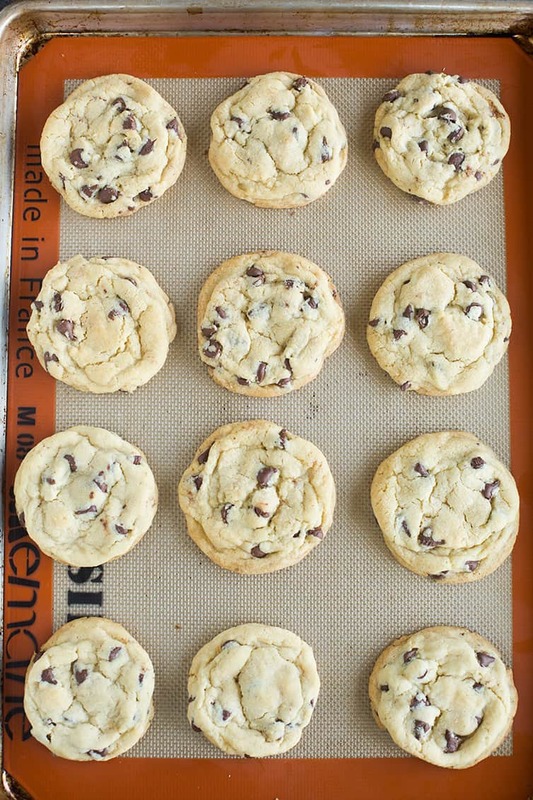 Bake until the edges of the cookies are light brown and set, but the centers still look pale, about 13 to 16 minutes. Cool the cookies on the baking sheet for 10 minutes, then transfer to a wire rack to cool completely. 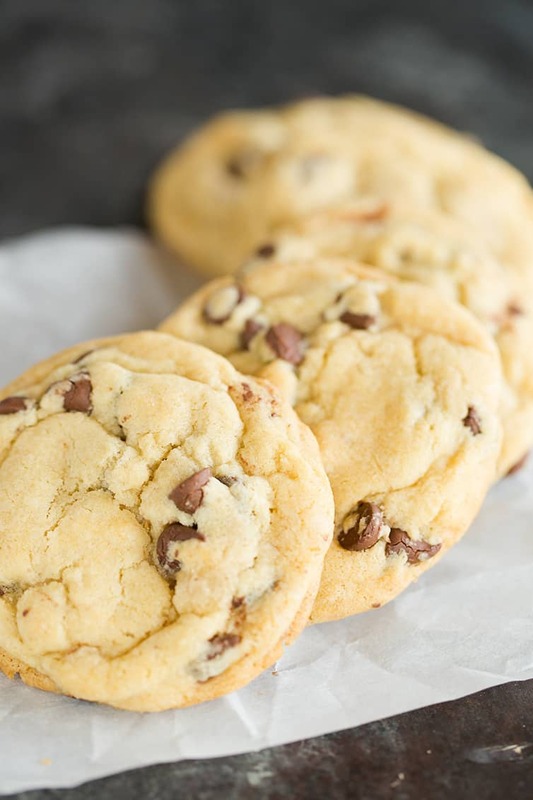 Leftover cookies can be stored in an airtight container at room temperature for up to 3 days, or wrapped in plastic wrap, placed in a freezer bag and frozen for up to 3 months. You can substitute all-purpose flour for the bread flour and cake flour; if you do so, use 3⅓ cups of all-purpose flour. Update Notes: This recipe was originally published in October 2015. It was updated in September 2018 with new photos and extensive recipe tips. These definitely are THE BEST cookies ever! I have made these over and over and cannot believe how good they are. This recipe is a MUST to have in your collection. These look amazing!! I can’t wait to bake them with my boys. Is this the same recipe as your Favorite Chocolate Chip Cookies recipe? I’ve been making that one for years and love it. The link I pinned for that recipe brought me to this one. I don’t recall separating any of the eggs though. I think the original recipe used two whole eggs. Was that the only change you made to the recipe recently? Thanks! Yea Michelle what gives? You’re messing with perfection here! Granted I do trust you, you’ve never steered me wrong, but the egg thing Ann brought up, and the cookie size and of course the adjusted baking time. Just had a family meeting about this, do we stick to the old tried and true, or go out on a limb and trust you’re expertise. Well I’m in your hands Michelle and gonna do it you’re new way. Suggestions on coverting to a white chocolate macadamia nut cookie? Hi Carolyn, I haven’t tried it, but I would just omit the chocolate chips and sub in white chocolate chips and chopped macadamia nuts. Thank you…I was thinking 1 1/2 cup white chips and 1 c nuts….do those ratios sound good or would you tweak? Not sure if my comment went through so I will try again. These were absolutely delicious. I could eat the whole batch but I better stop! Thanks for the fabulous recipe! These are so yummy! I could eat the whole batch but I better stop! Thanks for the fabulous recipe! !